Witness to talk via video linkup - Patrick C. Fagan, Q.C. A Mexican witness in a cocaine-smuggling case won’t have to worry about braving Canada’s cold winter, the Crown said yesterday. Prosecutor Dan Misutka said he will be applying to have the unidentified witness testify via video link from Puerto Vallarta, sparing him a trip to the Great White North. But the defence lawyer in the case isn’t exactly warming up to the idea. 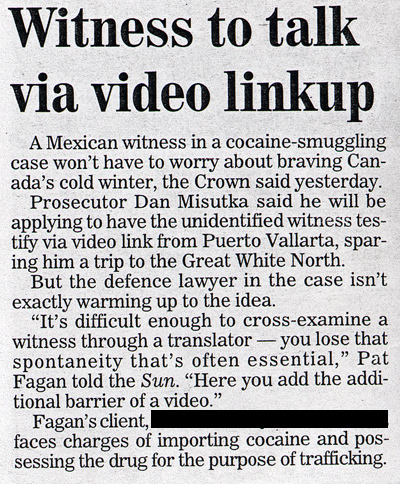 Fagan’s client faces charges of importing cocaine and possessing the drug for the purpose of trafficking.